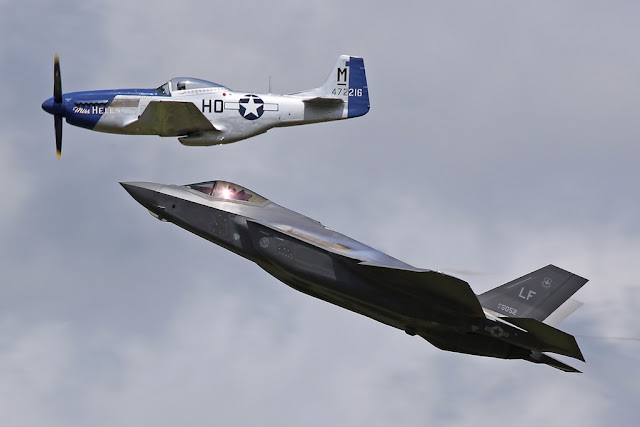 F-35A Lightning II and P-51D Mustang to perform over the Duxford Aerodrome in Cambridgeshire, UK. F-35 Heritage Flight confirmed for Flying Legends 2018. The 26th Edition of this world famous aerial spectacular will be held at the iconic Duxford airfield, UK, July 14-15. This airshow offers the occasion to enjoy world class, unrivaled, choreographed displays featuring unique aircraft types rarely seen together in the UK skies or anywhere else. The flying display includes several Spitfires, Hawker Hurricanes and many other legendary planes. The big surprise of this year's edition is the presence of the USAF F-35 Heritage Flight. The U.S. Demo Team had not included Duxford in the 2018 schedule, but considering that it will perform at the nearby RIAT airshow during the same days, its presence has become possible. The F-35A Lightning II fifth-gen stealth fighter will fly together the iconic P-51D Mustang over the Duxford airfield.